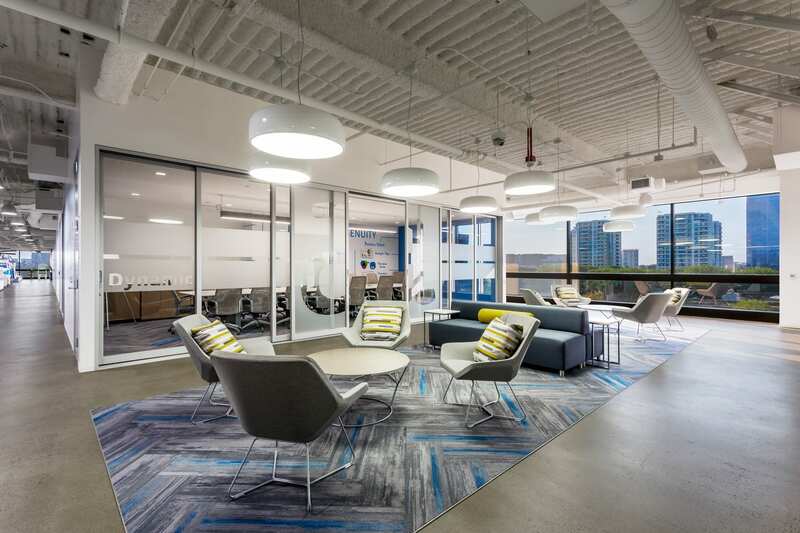 ​Capturing the Alteryx spirit, IA’s design for the new headquarters creates an inspiring workplace for a dedicated crew and celebrates a successful journey. Alteryx Headquarters, Irvine, CA. Photo © Kelly W. King Photography. Founded in 2010, Alteryx is a leader in self-service data analytics. For the firm’s new Irvine headquarters, IA focused on the founding partners’ rapport, their love of surfing, and the local—a stretch of California coastline renown among surfers. Sounds West-Coast-casual? Not quite. As co-founder and CEO Dean Stoecker puts it, “We’re not a start-up. We’ve been at this for a long time.” The new facility is both a milestone and a celebration. 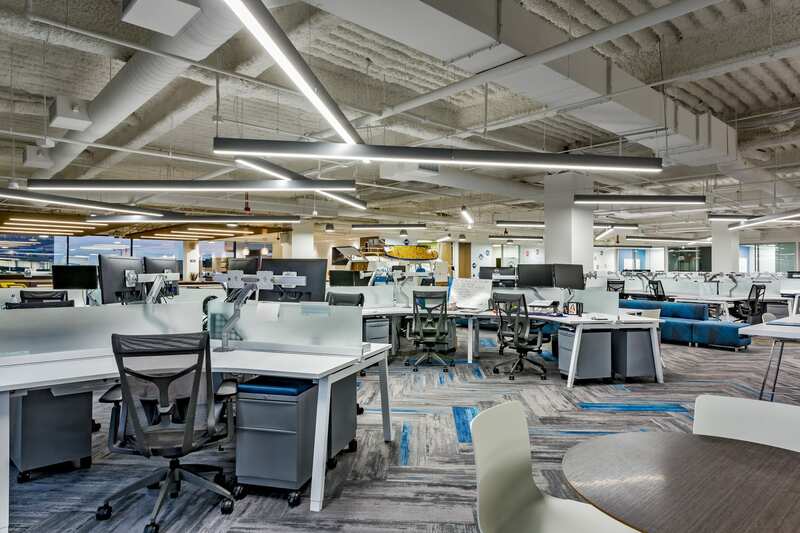 IA’s design achieves all aspects of the desired outcome—a headquarters that captures the Alteryx spirit and creates an inspiring workplace for its dedicated crew. The site, selected before IA joined the project, is particularly challenging—35,000 sq. ft. divided into two non-contiguous suites that face one another. The larger, 30,000 sq. ft., has windows on one side only but the smaller, 5,000 sq. ft., has none. IA removed the offices from the window line of the larger suite and added glass on the corridor side of both suites. This visually connects the two and maximizes the inflow of natural light from the windows and an adjacent atrium. 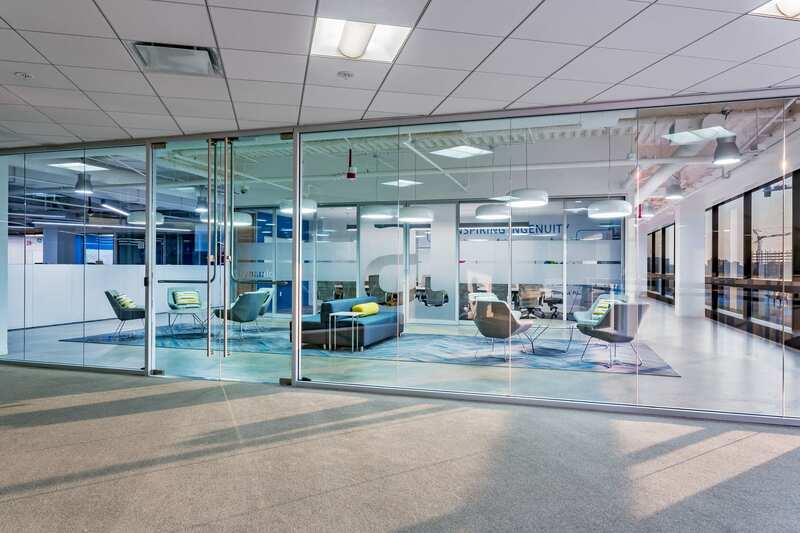 The smaller suite was developed as the main reception area and global training center. 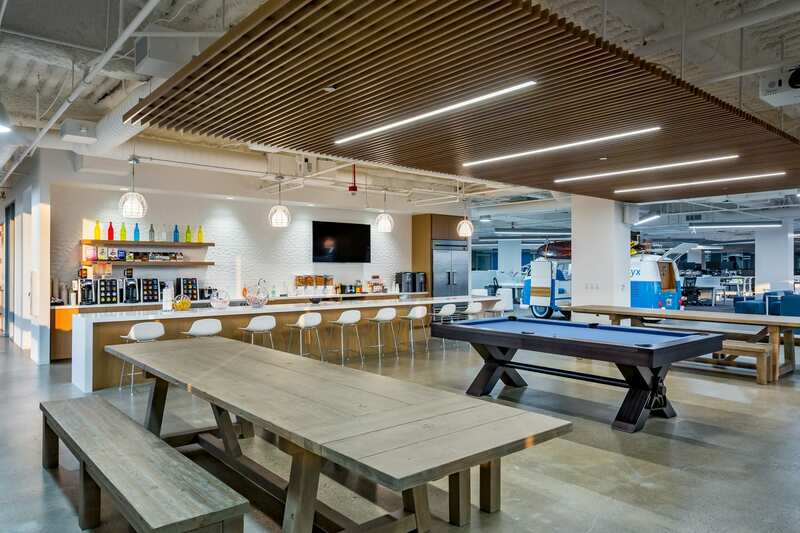 ​Alteryx Headquarters, Irvine, CA. Photo © Kelly W. King Photography. The headquarters supports two major user groups, corporate staff and application developers, with radically different needs for privacy and work patterns. The developers work in 120-degree workstations that offer high user visibility in an open environment. There are plenty of collaboration and breakout areas in a variety of seating environments—all open, some more private than others. The corporate users, who work best in traditional spaces, are ensconced in 93 cubes; most are 6 ft. by 6 ft., all are 42 in. high. A buffer of 27 private offices sits between the two groups. 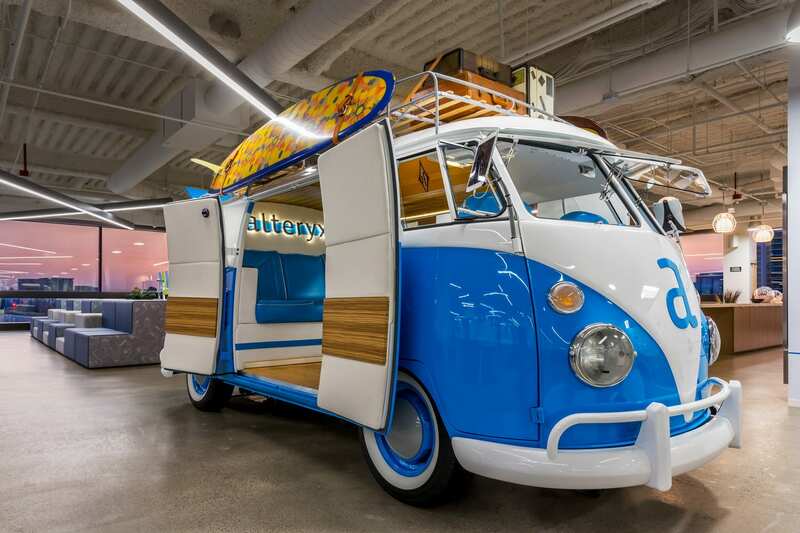 At the heart of the design—a symbol of the Alteryx journey—stands an authentic, customized 1962 Volkswagen bus, a client design requirement from the start. With the client and the firm tasked with the bus modifications, IA collaborated on all aspects of the vehicle’s exterior and interior to create a fully-functioning focus room with audio/video and sound system—the side mirrors are iPads that interact with the system. Detailed in Alteryx blue and bearing the firm logo, this surfing-culture classic comes equipped with kegs, taps, and cup dispensers, as well as the obligatory fully-loaded luggage rack with surfboard. Positioning the bus within the floorplan was an important aspect of IA’s overall design. Installed in the open area adjacent to the pantry and amenities for relaxation, the bus is easily-accessed. 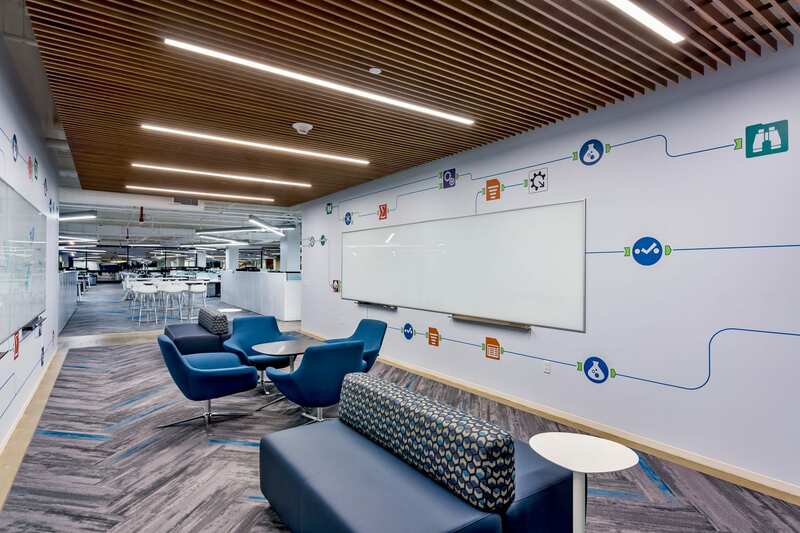 It sits within view of IA designed floor-to-ceiling graphics that display a timeline of the firm’s development—pre-history through projected future—and flow diagrams that feature the unique symbols and wayfinding used for guiding visitors through the Alteryx website. Installing the bus on the building’s fourth floor was a daring feat. A section of the exterior wall curtain had to be removed when the bus was craned in. Coordinated with the City of Irvine, this was a Saturday event that closed a lane of traffic and drew the local press. 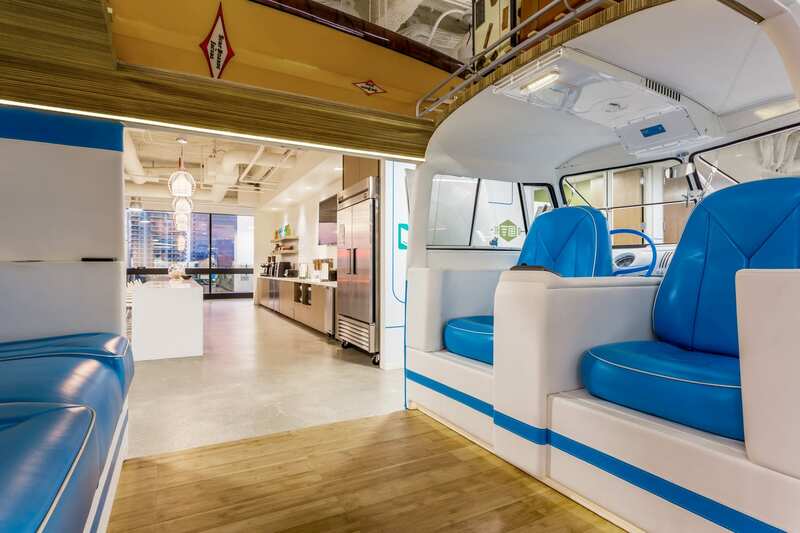 As a design feature, the Volkswagen’s engine was placed in the reception area, where a video introduces the founding partners and company culture. Then you'll probably enjoy learning about our work with Bacardi. Click below to see the project file, and let us know your thoughts on social media.